Senate Democratic Leader Chuck Schumer said that he and a bipartisan group of senators will take steps to block President Trump from being able to singlehandedly weaken U.S. sanctions on Russia. 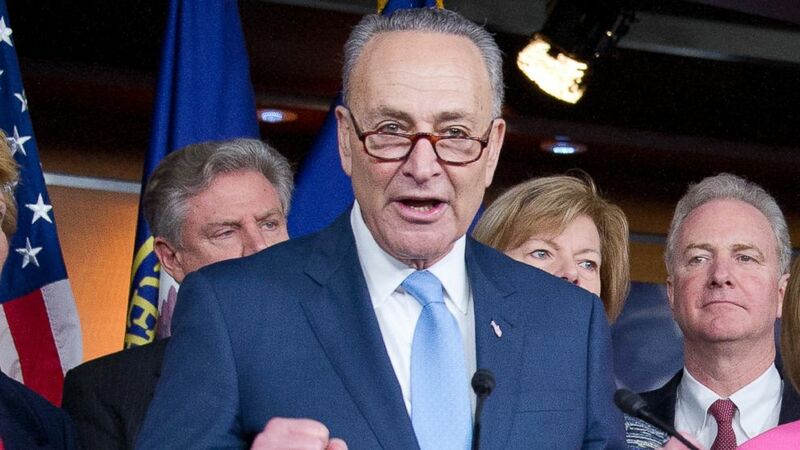 Schumer said Sunday on ABC News' "This Week" that the bill, to be introduced this coming week, is in response to the possibility that the Trump administration could offer to lift sanctions against Russia in exchange for Russia's reducing its nuclear arms. The New York senator said such an exchange would be misguided. "For us to repeal sanctions, given what Russia has done in Ukraine and threatened the Baltics, and now they have clearly tried to intervene in our election -- whether it had an effect or not -- that is something, that's a danger that we have never faced to this extent in American history. "We repeal sanctions, it tells Russia, 'Go ahead and interfere in our elections and do bad things;' it tells China; it tells Iran. That would be terrible," Schumer said. The Democratic senator added that Republican Sens. John McCain and Lindsey Graham, both of whom have been vocal critics of some of Trump's rhetoric on Russia, support the bill. Schumer also criticized Trump's speech to the CIA on Saturday and his inaugural address the previous day. "President Trump ought to realize, he's not campaigning anymore. He's president. And instead of talking about how many people showed up at his inauguration, he ought to be talking about how many people are going to stay in the middle class and move into the middle class," Schumer told ABC News' George Stephanopoulos. The senator said another thing that bothered him about Trump's inaugural speech, "as much as sort of the narrowness of it and the darkness of America that he portrayed, was this -- I think he's trying to use populist rhetoric to cover up a right-wing agenda." "If you look at this Cabinet, they are far from the populism that [Trump] talked about, people like [the nominee for health and human services secretary, Tom] Price, who want to end Medicare as we know it by privatizing it."